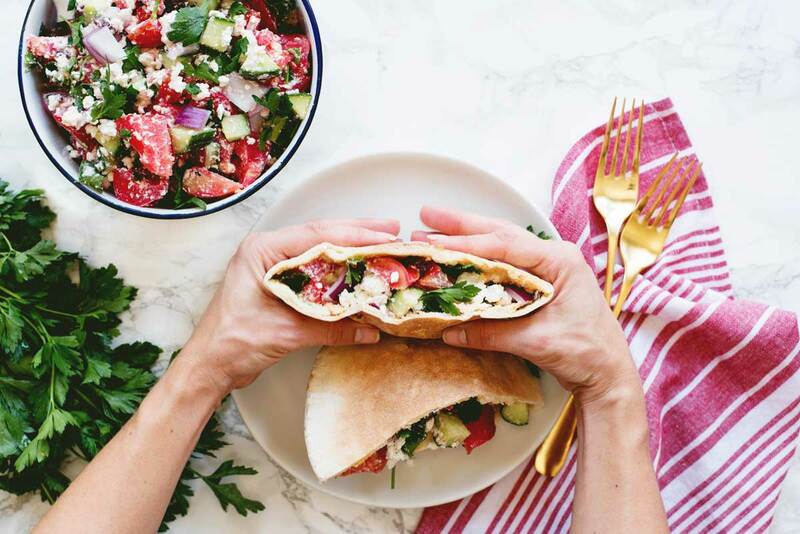 Mediterranean Pita Pockets are healthy and delicious. They are a great work or school lunch recipe and are packed with tomatoes, cucumber, feta and hummus. Mediterranean food is the best. 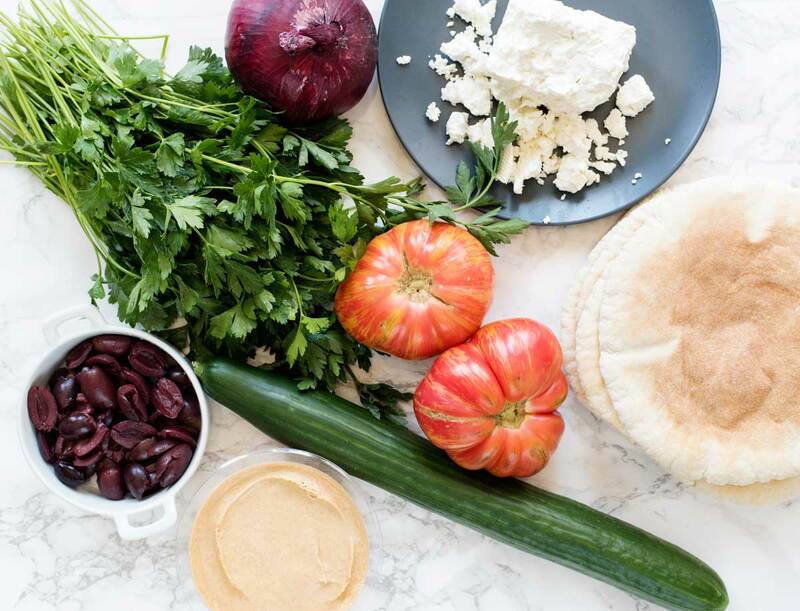 There’s a reason we physicians recommend following a Mediterranean Diet for people trying to lose weight and improve their health. It’s packed with vegetables and healthy fats and emphasizes moderation. It’s also really satisfying and fairly easy to follow. One of my favorite Mediterranean lunch places close to clinic recently shuttered its doors without warning. The day I found out, the anticipation of going there had built up all morning. When I arrived, expecting my favorite Mediterranean platter, I was devastated to see a padlock on the door. 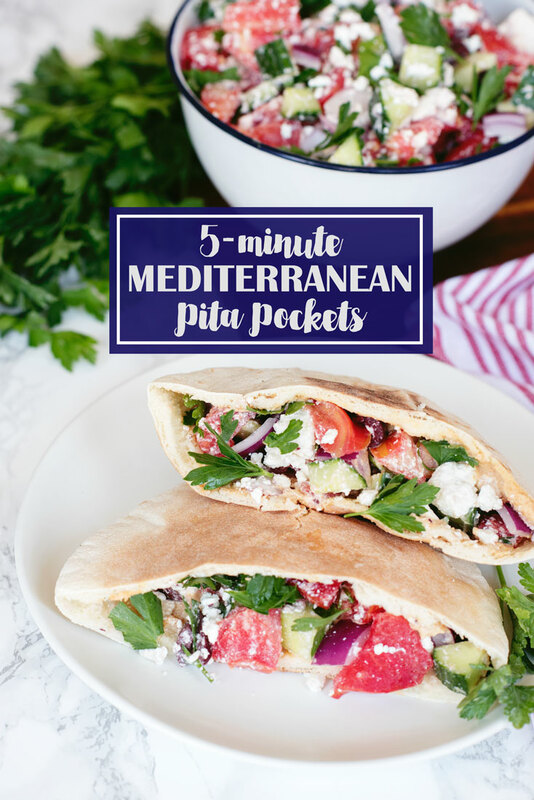 In order to get my Mediterranean lunchtime fix, I created these healthy Mediterranean pita pockets. Even when you’re short on time, this is a great recipe for an easy, home-cooked dinner. It also makes a great healthy school lunch or work lunch. Just pack the filling in a separate container with a dab of hummus and all you have to do is assemble it. You don’t even need a microwave! We love to make a big batch and eat them all week. I even eat just the chopped ingredients as a side salad – the fresh flavors and healthy veggies don’t get old. If you’re a visual person, the recipe video below explains it all. By the way, have you subscribed to my YouTube channel yet? You’ll find everything there from recipes to DIYs. Don’t forget to subscribe so you never miss a video! Mix cucumber, tomatoes, parsley, olives, onion, and feta in a large bowl. Use a spoon or spatula to spread a dollop of hummus along the inside of each pita pocket. Stuff with vegetable mixture. I used regular pita for this recipe, but found that the pita has a tendency to rip when stuffed. Pita pockets are a bit sturdier and will be less messy! Alternatively you can slice your pita into rectangles and use the hummus and vegetable mixture as a dip. 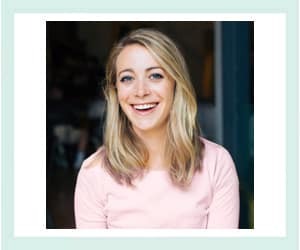 Girl, you are a natural with the videos! Love it! 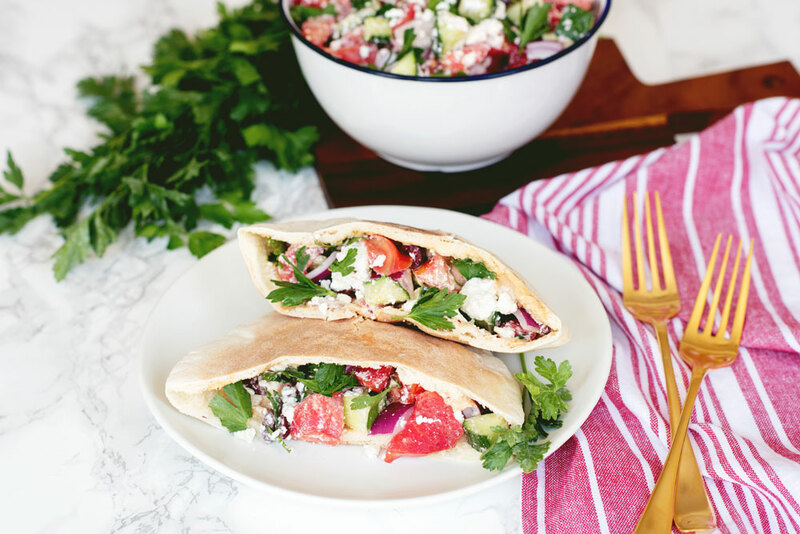 This recipe is amazing – I am always stuffing my salads into pitas or wraps to squeeze in some carbs, but the flavors in this look amazing. Bonus that you can have an extra bowl of stuffing on the side!